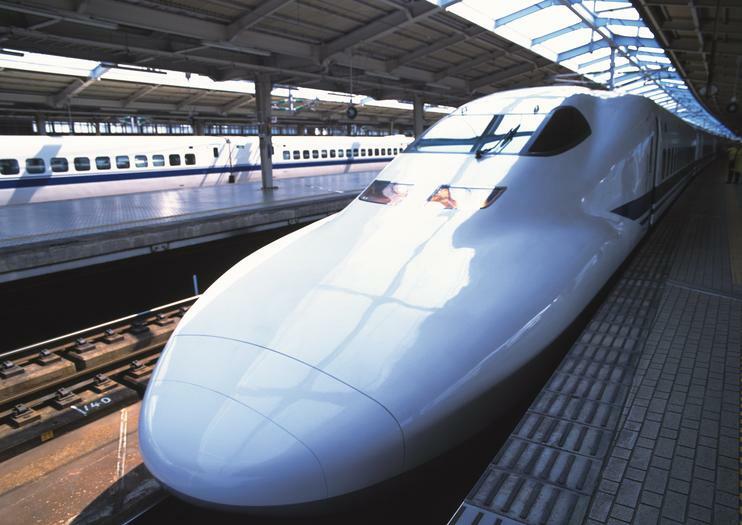 As Japan’s capital and major transportation hub, Tokyo makes an ideal base for exploring the nation by its excellent network of some of the world’s fastest trains. From Kyoto to Hiroshima, here are popular destinations you can visit by train. Those with limited time in Japan who don’t want to miss the sights of Kyoto can zoom there and back on a day trip by rail from Tokyo. This culturally rich city also serves as a first stop on many multi-day tours of the country, with high-speed trains departing from Kyoto Station to other points of interest. While there’s no Shinkansen bullet train from Tokyo to Mt. Fuji, a number of nearby stops offer connections to various areas on the mountain via bus service. It’s possible to get off at stops along the Tokaido Shinkansen bullet train line to transfer to local buses that continue on to Mt. Fuji. Alternatively, some travelers head to the famous peak, along with Hakone, Lake Ashi and Mt. Komagatake, by coach and continue on to Kyoto via bullet train. If you have a few days to spare outside of Tokyo, consider continuing your high-speed train journey from Kyoto on to Hiroshima. Touring this city offers sober insight into the aftermath of the Aug. 6, 1945, bombings. Nara, another destination often visited by bullet train from Tokyo by way of Kyoto, was Japan’s first permanent capital. It’s home to eight UNESCO World Heritage Sites and a wealth of pagodas, temples, and Buddhist shrines. Nagano, home of the famous snow monkeys, is also known for its natural hot springs, snow skiing in winter, and summer alpine hiking. If you want to get the most out of your time in Japan—this is the way to do it. Your three day tour will take you to Mt. Fuji, you’ll experience the thrill of a bullet train, see multiple UNESCO-listed sites in Kyoto, visit the deer park in Nara, and much more. You’ll have a stress-free experience with accommodation and transport organized for you, and a guide to navigate. Immerse yourself in the historical highlights and cultural delights of Kyoto and Nara on a 2- or 3-day guided tour from Tokyo. Leave Tokyo on a super-speed bullet train and begin your excursion in Nara, a city replete with sacred shrines and holy temples. Luxuriate in comfortable accommodation then spend the following day discovering the legendary landmarks of Kyoto with your accomplished guide. Opt for the 3-day option to experience a day of independent exploration in Kyoto and enjoy round-trip transportation from your hotel on both tours. Immerse yourself in Japan’s captivating culture on a two-day trip to Nara and Kyoto from Tokyo. Board a high velocity bullet train to discover five UNESCO World Heritage-listed highlights with an accomplished guide as you venture to Kyoto’s Nijo Castle and Kiyomizu Temple. Marvel at the sacred majesty of the Todaijii Temple and Kasuga Shrine in Nara and see all of Kyoto’s spectacular sights on a guided tour of the Helan Shrine and Imperial Palace. Accommodation, transportation, entrance fees and selected meals are all included in this tour. See the spectacular sights and historical highlights of Kyoto and Hiroshoma on a 3-day self-guided tour of two of Japan’s most famous cities. Ride a super-speed bullet train from Tokyo then embark on independent exploration of the UNESCO World Heritage-listen sites of the alluring areas; see sacred temples and moving shrines in Kyoto; feel emotionally stirred during visits to memorials in Hiroshima; and absorb the beautiful scenery surrounding Miyajima Island. Enjoy the freedom and flexibility of this self-guided tour, on which all accommodation and train tickets are included.